I’ve been getting a tightness in my abdomen quite like how you feel before a period, which is a little concerning. I don’t know if this is the terrible diet I’ve had recently though or the egg production. I’ve also been getting nosebleeds (just small ones) which, when googling (good ol’ google) can be an early sign of pregnancy (!). I know that isn’t the case! These are probably unrelated symptoms but I’m attributing blame to the IVF for everything. Feel like I may be getting a cold. That’s the IVF. I have put on a couple of pounds. That is the IVF. My house is messy. The IVF. God half term needs to hurry up and get here. Acupuncture later today. I’ll ask her about the bloating crampy feeling. The acupuncture seemed to have more effect this week. She did say it was accumulative. I feel quite spaced out but stress free. 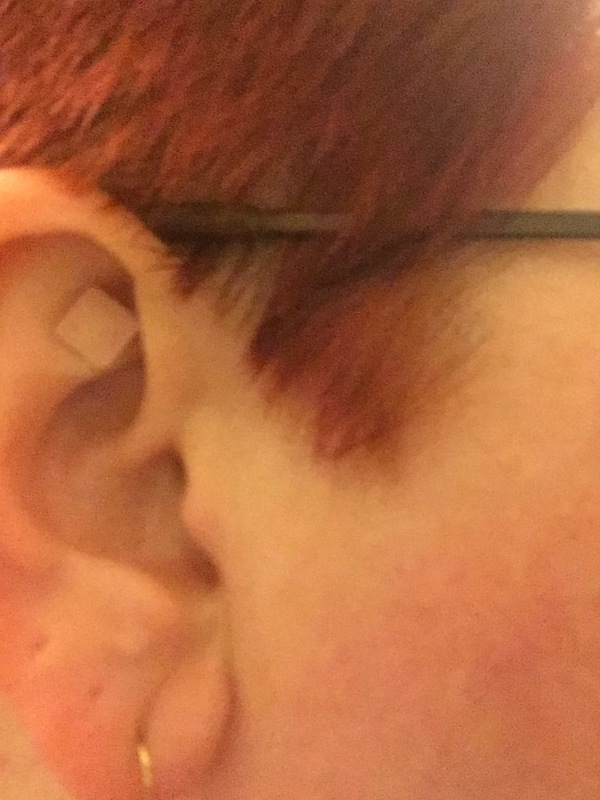 She has put a sticker with a small raised bump in each ear to continue the treatment. They help with stress relief. I said that I was feeling tension in my lower abdomen, like before starting a period, and she said it was normal and actually quite good. My eggs are probably pretty big now and sometimes the ovaries get so big they bash together! That’s an image! It made me feel positive about tomorrow’s scan, there are all the right signs. I told her I’m not feeling very stressed. The docs are all so knowledgable and everything seems to be going as it should. I know the implantation bit might be more worrying but, actually, right now I’m pretty zen. Maybe it is the acupuncture. On the tube home people keep offering me a seat. I’m hoping I’m a bit bloated and it isn’t all the Percy Pigs I’ve been eating recently.